TradeIX is rewiring trade finance by providing the most connected and secured platform infrastructure for banks, asset managers, corporates and value-added service providers. It is really important to know how trade finance works just so your business can grow properly. The team behind the success at TradeIX are driving a paradigm shift in the way they facilitate the flow of goods, assets, and credit in global and domestic trade. Built on Blockchain – distributed ledger technology, the platform’s applications, developer tools, and core protocol represent the dawn of the “internet of trade”. Powered by distributed ledger technology, our API-driven platform, developer tools and core infrastructure, provides a trade ecosystem which is a smarter, better connected, more secure platform for facilitating the movement of goods, assets, and credit around the world. Most interestingly, they call themselves a team of thought leaders who are instrumental in the creation of a new paradigm in trade and supply chain finance. They have worked with many of the world’s leading financial institutions and global enterprises and have been featured as speakers and panelists at major events for both private and public institutions worldwide. 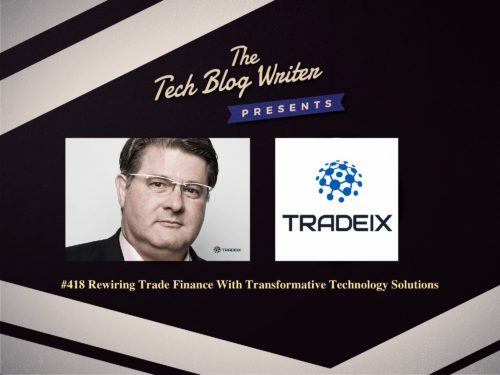 I invited Robert Barnes, CEO, TradeIX Limited to talk about how they are bringing transformative technology solutions to the world’s $8 trillion trade-finance marketplaces. Rob Barnes is co-founder of TRADEIX. Rob’s trade finance experience and expertise started in the logistics and financial technology sectors. In 2002, he founded PrimeRevenue Inc and was the CEO of one of the pioneers of supply chain finance (SCF) applications. He developed the largest non-bank SCF application with over $120B in annual processed volume through a combination of technology and services. In 2007, Robert founded the consulting company, Aradya and advised banks including HSBC, RBS, Morgan Stanley and Westpac on supply chain and trade finance.